Our journey down to Devon yesterday was accompanied by a very varied music choice. We took it in turns to choose from the iPod so it varied from Jacob’s “I like to move it move it” from Madagascar, through 80’s Wet Wet Wet, Michael Buble and Take That to Emeli Sande for Grandpa. A McDonalds break half way and games of I Spy and Car Chase made it pass quickly. We only brought a few essentials with us as we know that food shopping down here won’t be a problem. Today we’ve had a really nice day out. We started at The Donkey Sanctuary which is just up the road and because it’s not yet half term it was really quiet so the donkeys were all glad to see us. It is a lovely place to visit as it’s not at all commercialised and everyone is really friendly. 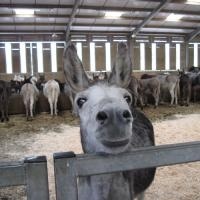 They have lots of things planned there over the next few weeks including Halloween events, a Christmas Fair and Candlelight Carol Service which is always lovely as they clear all the poor donkeys out of their lovely warm barn and set up the band in there for the singing. If the carols go on a little too long the donkeys start to bray and bang on the doors to hurry the event along! From there we went on to River Cottage Canteen for lunch. It was also market day in Axminster with a good selection of local produce as well as the usual market type stalls. It was really busy as usual but we got a table straight away. One of the nice things about the Canteen is because it is a bit laid back and rustic you feel very comfortable there with children. They always do a Little One’s menu but they can also choose a half portion from the main meals. Our grandson enjoyed some of the grown-ups Potted Lyme Bay Crab to start and then Battered Mackerel and Chips for his main course. He’s not a big eater so he didn’t eat it all but it was really tasty. 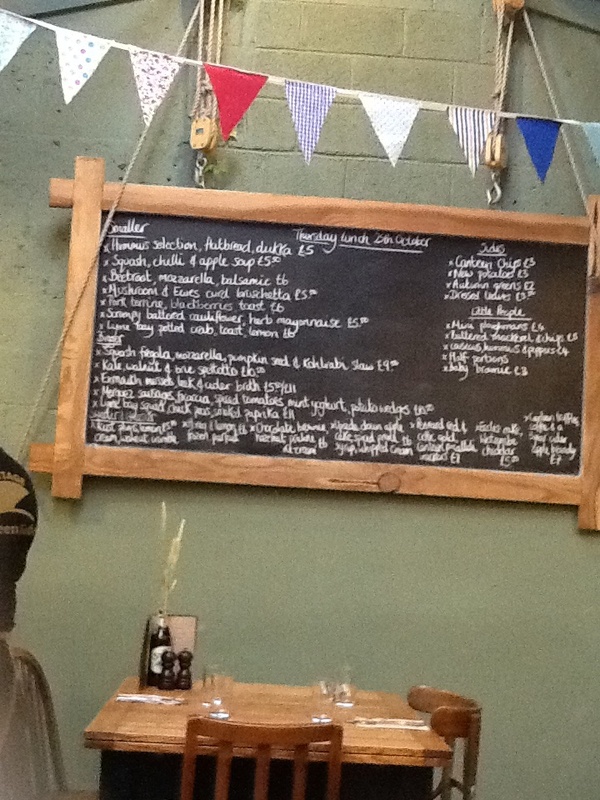 We had Exmouth Mussels and Merguez Sausage (which is spiced with chilli and Harissa) for mains which were really tasty. We had planned on desserts but we were all too full by then and had to give them a miss. The Lyme Bay potted crab was the nicest crab we’d ever tasted – probably because of all the butter but it was lovely even Jacob enjoyed it. It was quite misty today so instead of heading for our planned walk on the beach we went on to Otter Nurseries near Ottery St Mary for a wander but when we got there they were just finishing off their Christmas displays which are quite spectacular so we spent a long time exploring their lights and decorations. Jacob’s favourites were the moving polar bears and wooly mammoth! The weather is meant to be brighter tomorrow so hopefully we’ll get on the beach.